MAN Truck and Bus entered the Indian CV market ten years ago in 2006 and grabbed a notable market share in the medium and heavy-haulage segments in a short period with its CLA range of trucks. With substantial investments on its production facility in Pithampur, Madhya Pradesh, the company earmarks half of its production for domestic sales and the rest for exports to 40 different markets across Asia, Africa, and the Middle East. 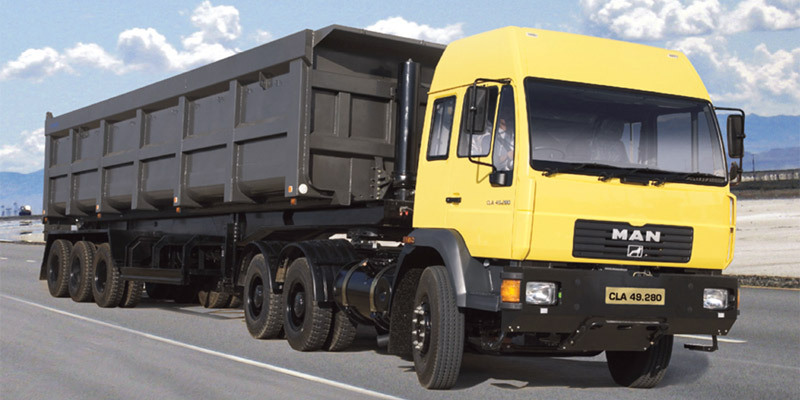 The MAN CLA range covers tonnages from 15 to 37 tonnes GVW (Gross Vehicle Weight) across a wide range of segments including cargo haulage (semitrailer tractors), tippers, construction equipment, and public utility category. A robust and flexible chassis and reliable engines are MAN’s greatest advantages, together with expanded nation-wide dealership coverage, they are increasingly preferred by the fleet operators. The CLA series compete with the trucks from Ashok Leyland Captain series, Eicher Pro range, and the newly launched Tata Signa and Mahindra Blazo range of medium-duty trucks. The CLA comes with modern cabs and sleeper cabs based on the proven MAN LE2000 series from the brand’s international line-up. The hydraulically-operated tilt cabin mechanism with tilt angle of 60 degrees ensures easy servicing and maintenance. Simply dashboard and ergonomics means just business and are quite durable to meet our standards. The telescopic and adjustable ZF- 8043 power steering is standard across all variants of the CLA. Power to the CLA trucks is sourced from the MAN D-0836 LFL 13 – a6.9 litre 6-cylinder in-line turbocharged intercooled diesel engine that delivers output in two different state of tunes – 220 hp and 280 hp – at 2,400 rpm. The engines feature common rail technology from Bosch and are compliant to BS 3 (Euro 3) emission standards. It is paired to either 6-speed manual gearbox or 9 speed ZF Synchromesh Gearbox with crawler gear. There is also an option of a BS 4-compliant (Euro 4) version of the same engine with a higher 300 hp output at 2,300 rpm, with a max torque of 1,150 Nm at 1,200–1,800 rpm. MAN claims that its engines are tolerant to high sulphur content fuel quality. The fuel tank capacity is 335 litres. The CLA’s top speed is limited to 78 kmph and its braking system includes an SS-cam, dual circuit, Air Actuated Drum Brakes with ABS and MAN patented EVB (Exhaust Valve Brake) as a minimum spec across all variants. The top-of-the-line variant MAN CLA-49.280-6×4 on-road tractor unit boasts additional features of planetary axle with hub reduction and inter-axle lock, and an aerodynamic high roof sleeper cabin with two berths. Along with the CLA series, the company also sells a front-engined bus chassis with full air suspension and 220 hp engine in the domestic market. Next, would you like to read more on MAN, Trucks, or Commercial Vehicles?